System control always automatically selects the most economical energy source or most economical energy mix. Innovative air-gas principle for flexible adjustment to heating gas and power prices – if power is lower in price, for example, the bivalence point can be lowered so that the heat pump module assumes a larger share of heat generation. Share of renewable energies can be theoretically increased to 100 percent. High degree of operating safety due to redundant system: if a component fails, the other components assume its function. Flexible Flue Systems also available. 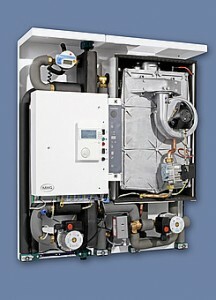 All units are supplied with a 36 month warranty and 60 month heat exchanger warranty.